After several mutations and an improbably long hibernation, The Wild Armadillos have returned to produce their strongest album yet and to re-emerge on the live music scene. The Armadillos date back more than a quarter of a century. In 1987 David Mason-Cox (aka dmc) and Doug Weaver formed a new band specifically to give voice to the complex, edgy and melodic songs that dmc had been writing since leaving school at 15 to pursue a musical career. Along with drummer Gary Habgood, multi-instrumentalist Charlie Cole and guitarists John Baker, Mark Carroll and Kevin Bennett they recorded the first CD Don Quixote on a Barbed Wire Fence in 1989-90. Joy Howard contributed impeccable harmonies while Dave Zaikowski and Andrew Thomson played slide guitar and saxophone respectively. For 1992’s CD Tripping Upstairs, Hamish Stuart took over percussion responsibilities and dmc moved from bass to guitar. Wayne Kellett, Ian Belton, James Gillard and producer Tim Ryan shared bass duties and David Ferguson and Kevin Bennett played electric guitars. Dave Zaikowski, now a full-time member, delivered melodic and haunting slide guitar, Charlie Cole contributed his trademark keyboard parts and Joy Howard once again provided the most angelic harmonies. 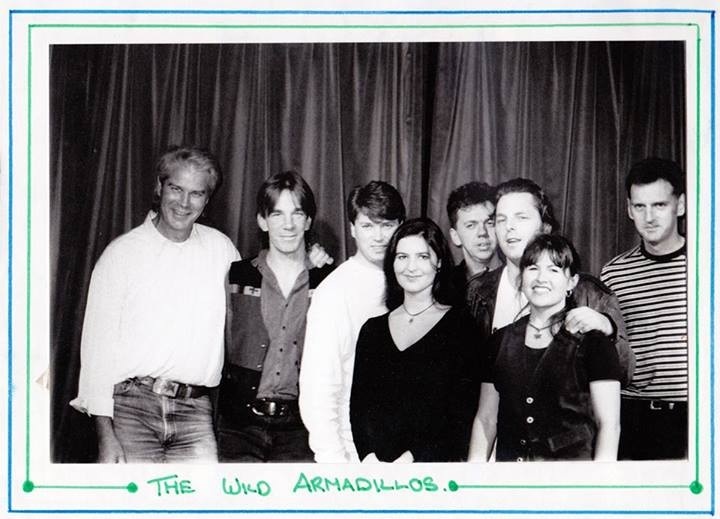 By 1993 The Wild Armadillos had evolved into a powerful eight-piece ensemble. Their 1995 EP, Evangeline features dmc – vocals & acoustic guitar, David Ferguson – electric guitar & vocals, Dave Zaikowski -slide guitars, keyboards & vocals, Wayne Kellett – bass & vocals, Charlie Cole – keyboards & vocals, Joy Howard – vocals and guitar, Lara Goodridge – vocals & violin and Mark Meyer – drums. However, by 1995 times were tough for such a large band so they took a break, which lasted until 2005 when the slimmed-down group began recording sessions for this is what we do. David Ferguson, guitars & vocals, is one of the longest serving members of the band. David, (aka Ferg, aka The Tractor of Love), joined in 1990 after playing with the Queensland legends Emu and later with Sydney’s The Honeymoon. When that band’s first album, Promise failed to make an impact the group fragmented so Ferguson focused his attention on his other career and has become one of Australia’s premier lighting designers. David recorded with The Wild Armadillos on Tripping Upstairs and Evangeline. He returns with a vengeance on this is what we do, to deliver searing solos and finely- crafted rhythms. Dave Zaikowski, slide guitars, keyboards and vocals, is another long-term Wild Armadillo after signing on during the making of Don Quixote on a Barbed Wire Fence. Originally hailing from Rhode Island, he performed in the US and Austria before bringing his music to Australia. In the 80’s he toured with Bakehouse and played regularly at Newtown’s Sandringham Hotel. On this is what we do Dave makes his recording debut playing keyboards as well as his usual wailing slide guitars and plaintive lap steel. Malcolm Wakeford, drums & vocals, has been playing with dmc for twelve years and has made himself indispensable by providing The Wild Armadillos with solid rhythms and irresistible grooves. Mal has played with a veritable Who’s Who of musicians during his career. His credits include touring and recording with such luminaries as Little River Band, Redgum, Flying Emus, Jackie Orszaczky, The Imports and Ayers Rock and Australian tours with New Orleans maestro Dr John and the legendary Albert Lee. A king of rhythmic nuance, his playing on this is what we do is an excellent example of Wakeford’s masterful drumming. Wayne Kellett, bass & vocals, joined the band in 1992 after playing on Tripping Upstairs. He also played on Evangeline before The Wild Armadillos went into hibernation. He has been playing bass with Kevin Bennett and The Flood for many years and previously worked with David Ferguson in both Emu and The Honeymoon. Kellett’s slinky and sinuous bass parts add an extra dimension to this is what we do. Doug Weaver, guitars & vocals, was a founding member of The Wild Armadillos before following a career as a producer, composer, songwriter and session guitarist. Since joining The Idle Rich in 1982 he has consistently been one of dmc’s musical partners. When Weaver joined the sessions for this is what we do he immediately added an indefinable edge to the band. His trademark sonic signature is always evident and his ear for arrangements helped refine the band’s sound. Among his current projects is his work as music editor and composer for the popular TV series Mythbusters. He is co-writer and guitarist with Chris E Thomas and also with Scarlet Hearts, one of Sydney’s hottest new bands. Weaver mixed this is what we do and his clear musical vision and production talents are obvious throughout the album.